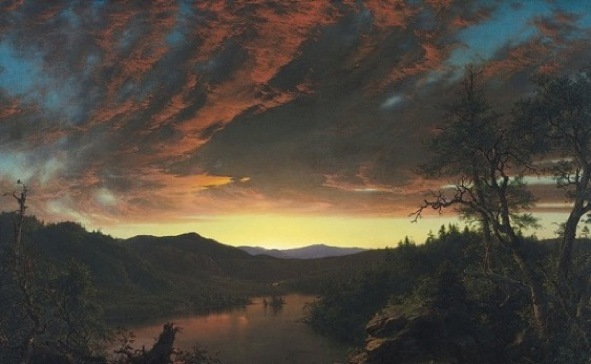 When it comes to wowing an audience, few can touch Frederic Edwin Church, the grand master 19th century Hudson River School painter whose jaw-dropping landscape panoramas rank among the nation's great cultural icons. Church's paintings were big on view -- really big on view -- with cinematic showstoppers like "Heart of the Andes" and "Twilight in the Wilderness" and the vertiginous image of a roiling "Niagara Falls." 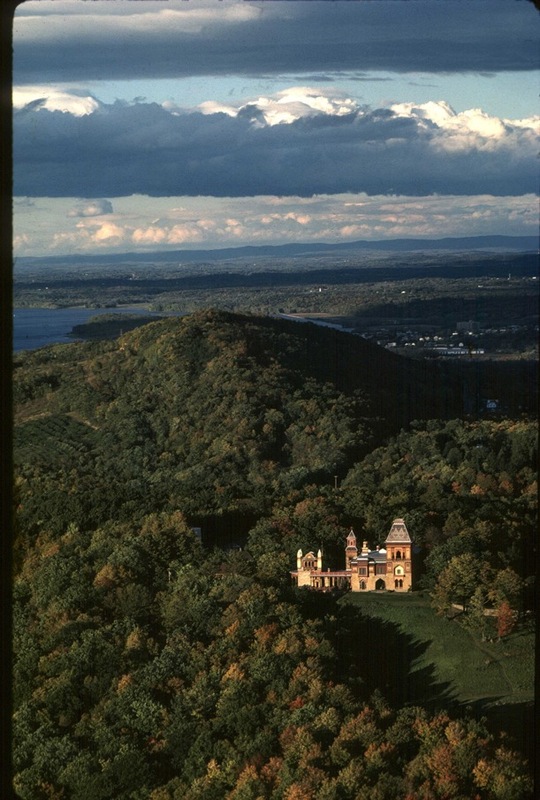 As a painter, Church depicted views -- at Olana, his Persian-inspired home along New York's Hudson River, he "borrowed" views, meaning the design of Olana's picturesque landscape incorporated the dramatic vistas beyond the property's boundaries. 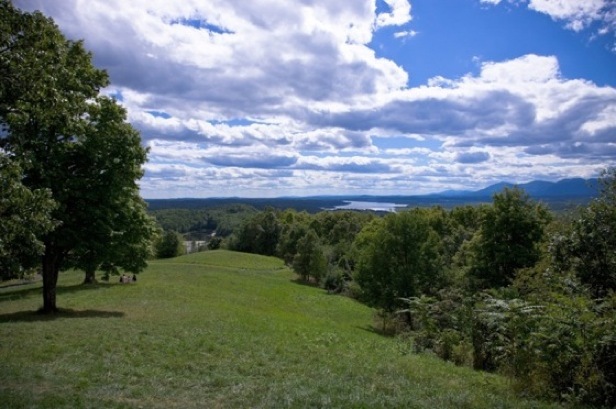 These views, what landscape architects call "viewsheds," are one of Olana's defining characteristics and their importance is the subject of an April 16, 2011 symposium at Olana, Framing the Viewshed: The Transformative Power of Art and Landscape in the Hudson Valley. This is worthy of national attention, because what's happening at Olana sets a benchmark for understanding, interpreting, and protecting viewsheds at other cultural properties. The significance of Olana's viewshed is tied to a larger concept, the origins of the American attitudes about scenic conservation -- the idea, for example, that it was important to preserve a place like Niagara Falls. Segue to Church -- he broached the idea of preserving Niagara as early as 1869 and worked privately with the pioneering landscape architect Frederick Law Olmsted, Sr. and architect H. H. Richardson to build public support. In the 1870s, along with the Niagara dialogue, Church served as a Parks Commissioner in New York City and, along with the building out of Central Park, had myriad professional and personal connections to both Olmsted and Calvert Vaux who also advocated for both designed and borrowed viewsheds in their own writings and built works. Therefore, it is no accident that Church applied and experimented with these overarching ideas at Olana. 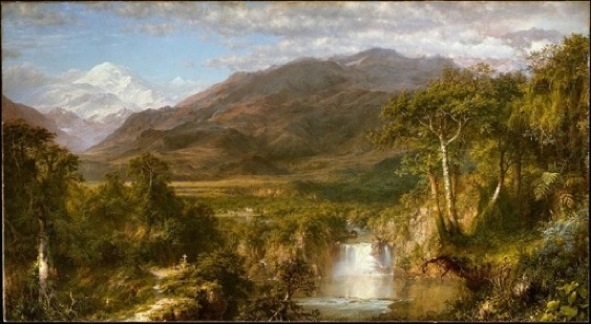 He expressed his own sensitivities about providing and designing democratic grounds, and orchestrated unique scenographic landscape experiences -- complete with an unrivaled, "borrowed" panorama. Since Olana's initial National Historic Landmark (NHL) designation in 1965, the way we view picturesque landscapes such as Olana and Central Park (designated in 1963) has evolved. Knowledge of the site's past has grown substantially and available scholarly historical context on Church, Calvert Vaux, Frederick Law Olmsted, Sr., and Hudson River School painting and landscapes, has burgeoned. Today, with Olana pursuing World Heritage Status and so much of its historic viewshed now strategically mapped (and much of it protected), there is sufficient rationale to revisit how Olana assigns significance and value to its cultural landscape -- through the lens of its "borrowed scenery." The landscape painter is trained to see the color relations of each to the other, and pays habitual attention to such combinations. To him the sky is constantly visible, asserting itself as a fact more positive even than the subjects in front of it. The typical landscape painter may be said, indeed, to observe the aspects, rather than the forms of nature. He is fascinated by some effect of light and shade and color that depends on the particular season of the year, or the sunlight and atmosphere of some special hour of a day. To this he is attracted in connection with a group of harmonious lines; and he sees and paints his beautiful picture, which is, in fact, devoted to the illustration of a passing moment of time. It is evident therefore, that in laying out a country place, large or small, with reference to its landscape attractions, the present and prospective sky line is one element of design that needs very skillful attention. With the conference Framing the Viewshed, which recognizes the intrinsic role that borrowed scenery plays in nearly every nationally significant region, the Olana Partnership is placing the site's character-defining visual and spatial relationships first, while also advancing a deeper, more nuanced understanding of what the view from Olana means. First, through the lens of its historic origins (Church, Vaux and others); second, through its own place in the 1960s preservation movement; and lastly, as 21st century stewards armed with preservation planning and design tools that will bring a balanced management perspective of Olana's viewshed -- one that embraces myriad natural, scenic and cultural values. It would appear the Olana Partnership is drawing a line in the sand (or perhaps metaphorically along its terrace and overlooks), suggesting the time has come to move beyond the earlier, limiting approach of structure as object -- once cast and put into motion with the 1965 NHL designation and instead revisiting its own authenticity and significance by placing Olana's cultural landscape, and its own integral setting first. Building on this concept, we can even reconsider Olana in a deeper, more holistic way by elevating the stature of its nature as the object -- what Gina Crandall in her book, Nature Pictorialized (The Johns Hopkins Press, Baltimore and London 1993), refers to as a way of seeing and, "whether we want to or not, [our] notions of value and form, which relate, not just to seeing the land, but to seeing it in a certain way -- pictorially." The results of this expanded approach: Olana's overarching interpretation and stewardship goal is transformed to one that promotes and values seeing like Frederic Edwin Church -- the landscape painter, landscape-maker and pioneering conservationist. Olana's embrace of its unique and trailblazing story of its borrowed scenery and viewshed protection is significant as it frames its quest for World Heritage status. This approach can not only provide a powerful tool for how Olana presents itself and manages its own change and it also provides essential insights into the understanding, interpretation and stewardship of sites nationwide.